Rainforests covers less than 2 percent of the Earth’s surface, but contains nearly half of Earth’s plants and animals. Rainforests are also rich in resources, such as palm oil, rubber, and medicines, and therefore are often threatened by human industrial activities (“Rainforest Facts”). Worldwide, tropical rainforests are mostly founded in the region between the Tropics of Capricorn and Cancer, including the Amazon Basin of South America, Southeast Asia, and the Zaire Basin of Africa (“Distribution of the Tropical”). Some of the world’s most biologically diverse tropical rainforests are located in Indonesia. Harapan rainforest covers 98,555 acres of lowland forest on the Indonesian island of Sumatra, in the provinces of Jambi and South Sumatra (Loucks). Harapan rainforest is one of the biodiversity hotspots of the world. It is home to many of the globally threatened species, including Sumatran tiger, Sumatran rhinoceros, orangutan, Asian elephant, Malayan sun bear, and Clouded leopard (“Forest of Hope”). Rainforests of the Southeast Asia are among the oldest rainforests of the Earth. The fossil records of the rainforests on the island of Sumatra date back to 300 million years ago, when they began to form as primeval swamps forests. Although it is widely regarded that these tropical rainforests have been formed between 2.6 to 65 million years ago, it has been proved that the climate in those region has changed in last 30,000 years. This means that the wildlife and vegetation of tropical forest today may be different from those in that area million years ago (Whitten). The rich biodiversity of the Sumatran rainforest dates back to the island’s geologic history. Hundreds of million years ago, the islands of Sumatra, Java, and Borneo were all connected with Malaysia. At the end of the ice age, the glaciers melted and sea levels rose, splitting the landmass into parts. Such geographical isolation lead to uniqueness in biodiversity on each island (Benders). The island of Sumatra was mostly covered with tropical rainforests historically. Before the loss the forest from human factors, the Sumatran tropical rainforests were intact and full of diverse range of species, including many endemic species. To date, 305 bird species, 54 mammal species, and over 600 species of trees have been recorded at Harapan rainforest (“Forest of Hope”). Sumatran Elephant, the smallest Asian elephant, is facing critical danger from the deforestation of the Harapan rainforest. There are only 2,400 to 2,800 individuals left on the Sumatran island (“Sumatran Elephant”). 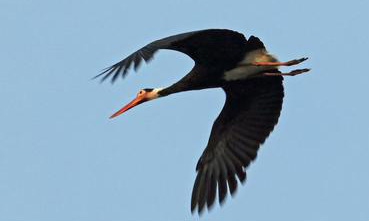 Storm’s Stork is a large stork that is distributed in southern Thailand, Malaysia, and Indonesian islands. It is about 75-91cm tall, has white and black plumages with red bill. It is currently facing extreme danger, and the estimated number of population is about 500 (Benstead). Clouded Leopard is a medium-sized cat that ranges in Southeast Asia from Nepal and southern China to Indonesia, mostly in the primary tropical rainforests. It is one of the endangered species of the world, and is rarely spotted. The remaining number of Sumatran clouded leopard is 3,000 to 7,000. Clouded leopards rank the top as a good climber even among the cats, which are known for its climbing ability (“Clouded Leopard”). Sumatran Rhino is also an endangered species that is found in the Harapan rainforest. It is one of the smallest living rhinoceroses, and the only Asian rhino with two horns. Among the world’s rhinoceroses of today, they are most closely related to the woolly rhinos that went extinct. Only two females have reproduced during the last 15 years, and it ranks second as the most threatened rhinos (Long). Rafflesia arnoldii, or corpse flower, is the largest known flower of the world. The size of its size ranges up to 1 meter in diameter. It is found on the islands of Sumatra and Borneo, and the conservation status is not that good due to tourist disturbance and collection of flower buds for traditional medical use. It is known to have a smell of rotting flesh (Kok). In the area, there are many of threats which cause a forest destruction. An indiscreet logging and clearing for plantation and cutting timbers for expanding the land of agriculture makes decrease habitats and cause extinction of unique species. In addition, people's encroachment, mining, and logging are all illegal acts, and such their illegal logging is also for using some wooden materials. To cultivate a commercial purpose, people cut the original trees to plant palm oil or pulpwood plantations. Forest fires and heavy rains in 1988 also contribute to cause destruction of forest and landslide, but the main fact of it is that the continuous illegal logging and encroachment. (“BirdLife International”) On this account Harapan rainforest, which is well known as living a diversity of species, is destructed over 60% forest for the past fifteen years (Whitten). Several funders, Germany’s Federal Ministry for the Environment, Nature Conservation Nuclear Safety (BMU), Singapore Airlines, Conservation International, European Union, Protection of Birds in the UK, and Nature and Biodiversity Conservation Union (NABU) in Germany, tried to support for Harapan Rainforest Project (Lang). For instance, Singapore Airlines donates 3 milion dollars and International Climate Initiative (ICI) contributes 9.4 million dollars lthrough KfW Entwicklungsbank development bank. (Wardah) In addition, now the three organizations, which are The RSPB (BirdLife in the UK), Consortium of BirdLife International, and Burung Indonesia (BirdLife in Indonesia), all joined forces for the recovery and protection of this area, where located in straddling Province of South Sumatra and Indonesia's Jambi. For this reason, the area has been named Harapan, which means a 'hope' as Indonesian word (IGES 44). The project is one of the biggest restoration program of the world and it is not short-term but long-term project. Through the restore project, in fact, indigenous people said that they were difficult to live in Harapan Rainforest before, but now they have a job to protect forest and arrange the habitat for animals and became much easier to live in due to many of organizations' steady endeavor. HRF is specifically aimed at restoring dry lowland forest of around 100,000ha in Sumatra because People can get many of benefits from Harapan rainforest; absolve up to carbon of five million per year, and thereby managing of climate change; play important role of releasing of oxygen; prevent flooding and soil erosion; provide a safe habitat for unique wildlife and threatened species; and provide a sustainable livelihood to local population. It is important to offer food, shelter, and medicine to indigenous people. Particularly, because it is well known as rich of the biodiversity, it is necessary to protect and regenerate. The video attached below suggests how benefits are in HRF, what efforts are processing, and the reality and lifeof indigenous people. In fact, the diverse conservation activities for Harapan Rainforest is planned and animated. There are several steps which are implementing in HRF; prevent the forest fire by setting a monitor; patrol the forest and ward off illegal logging, wildlife poaching, and encroachment; study and recognize where the area of rich biodiversity; and let local population inform how it is benefits and important for all of them by offering them a job which preserve and manage the forest. (Natural News) There are also some more missions to restore; in a sustainable way, performing and create the environment to manage the forest systems for the natural production; making a best use the income from the eco-tourism; and arranging training and research by providing both the opportunities and educational facilities. (Lyimas) Likewise, many of not only inside but also outside organization are trying to regain HRF's previous form and function, and moreover, assistance and effort of local people is necessary. 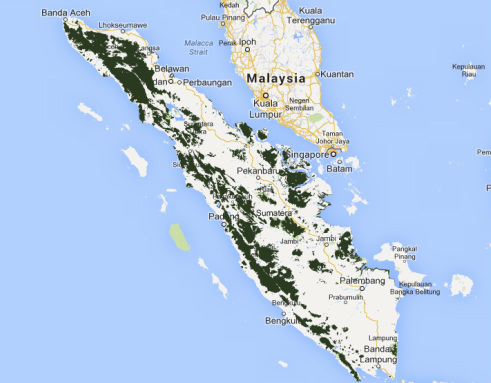 The future of Harapan rainforest is very positive because of many conservation efforts. In Indonesia, the new forestry law was enacted to enable the protection of a large tract of lowland rainforest in Sumatra (Oryx, 2007). This new law will allow non-governmental organizations (NGOs) that have been working to create the Harapan Rainforest Initiative to create the first forest ecosystem restoration concession (Oryx, 2007). According to Asahi news (2010), Harapan Rainforest Initiative is a groundbreaking project aimed at conserving and protecting over 100,000 hectares of one of the most biodiversity rainforests in the world. Thanks to Harapan Rainforest Initiative, it is believable that Harapan rainforest will be better than now. These plans such as the new forestry law and Harapan Rainforest Initiative will prevent ecosystem from logging, building, and pollution, etc. One of the good news is that Singapore Airline decided to donate about 3 million dollars to the Harapan Rainforest Initiative. These changes and helps from government and Singapore Airlines, Harapan rainforest will be protected. Also, in this area, there are a lot of bird species (over 290) and 55 mammals, and Sumartran tiger. They are endangered species, but they will be safe if the Harapan Rainforest Initiative successfully goes off in the future. Therefore, future generation in Indonesia can get clean environment and biodiversity in Harapan Rainforest. To protect Harapan Rainforest, there are many ways to recommend. Firstly, education of local people is one of good ways to preserve this area. Through education, people will realize how important this ecosystem is for them. In Harapan Rainforest, there are a lot of endangered species, but many people do not recognize it seriously. So, we can publish catalogue or pamphlet that deal with the issue of endangered species in Harapan Rainforest. After reading the catalogue, people may regret their carelessness, then try to protect wildlife. Secondly, people need to make money by payments for ecosystem services because conservation efforts are not going to be cost-free. Economic pressure will not allow rainforests to persist if they are completely closed off from use and development (Rhett Butler, 2012). Thus, people can make profits by making ecotourism. Ecotourism can fund efforts both through park entrance fees and employing locals as guides and in the handicraft and service sectors (Rhett Butler, 2012). Using ecosystem for fundraising will support the conservation of Harapan rainforest. Thirdly, people need to get more corporate sponsorship to preserve Harapan Rainforest. As above I said, Singapore Airline donated 3 million dollars for Harapan Rainforest Initiative project. Like this case, if there are more donations for Harapan Rainforest Initiative, it is easier to improve this project. In my opinion, writing appeal letters for help to company is effective way to get donation. Lastly, to protect endangered species, people can feed them. Actually, people cannot feed all species in the forest, but feeding may be useful in staving off the extinction of colonies (Oryx, 2007). Benders, E. "Southeast Asian Rainforests." Blue Planet Biomes, n.d. Web. 26 Nov. 2013. <http://www.blueplanetbiomes.org/se_asian_rnfrst.htm>. Benstead, P. "Storm's Stork Ciconia Stormi." BirdLife International, n.d. Web. 25 Nov. 2013. <http://www.birdlife.org/datazone/speciesfactsheet.php?id=3833>. "Clouded Leopard." National Geographic, n.d. Web. 25 Nov. 2013. <http://animals.nationalgeographic.com/animals/mammals/clouded-leopard/>. "Distribution of the Tropical Rainforest." ThinkQuest. Oracle Foundation, n.d. Web. 26 Nov. 2013. <http://library.thinkquest.org/C002061/distri.htm>. "Forests of Hope Site - Harapan Rainforest, Indonesia." BirdLife. BirdLife International, n.d. Web. 27 Nov. 2013. <http://www.birdlife.org/worldwide/projects/forests-hope-site-harapan-rainforest-indonesia>. "Hope for Sumatran Rainforest." Cambridge Journals. N.p., n.d. Web. 24 Nov. 2013. Kok, Rogier De. "Rafflesia Arnoldii." Kew, n.d. Web. 25 Nov. 2013. Lang, Chris. 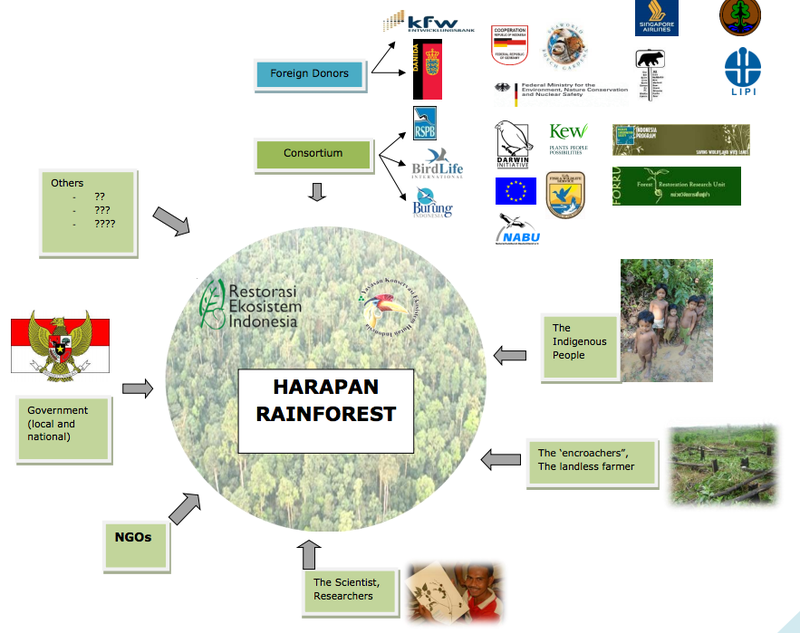 "On-going Land Conflicts at Harapan Rainforest Project: As a Key Funder of Harapan, What Is the German Government’s Response?" Redd-monitor.org. N.p., 19 Dec. 2012. Web. 02 Dec. 2013. Long, Barney. "Sumatran Rhino." WWF Global. World Wildlife Fund, n.d. Web. 25 Nov. 2013. <http://worldwildlife.org/species/sumatran-rhino>. Loucks, Colby, and Tony Whitten. "Southeastern Asia: Island of Sumatra in Indonesia." WorldWildlife. World Wildlife Fund, n.d. Web. 27 Nov. 2013. Mardiastuti, Ani. "Police Busted the Largest Illegal Pangolin Trade Operation." 2008 Top News on the Environment in Asia: 42. "Rainforests Facts." The Nature Conservancy. N.p., 6 Oct. 2011. Web. 25 Nov. 2013. <http://www.nature.org/ourinitiatives/urgentissues/rainforests/rainforests-facts.xml>. Rhett, Butler. "How to Save Tropical Rainforests." Mongabay.com. N.p., n.d. Web. 24 Nov. 2013. "Singapore Airlines Commits To Rainforest Preservation." Asahi.com. N.p., 20 Aug. 2010. Web. "Sumatran Elephant." WWF Global. World Wildlife Fund, n.d. Web. 25 Nov. 2013. <http://wwf.panda.org/what_we_do/endangered_species/elephants/asian_elephants/sumatran_elephant/)>. Wardah, Nyimas. "Harapan Rainforest: Cultivating or Ignoring Hopes?” Wageningen University, Rural Development Sociology Group, Aug. 2013. Web. Whitten, Tony, and Sengli J. Damanik. The ecology of Sumatra. Vol. 1. Periplus Editions, 1999. Web. 2 Nov. 2012.